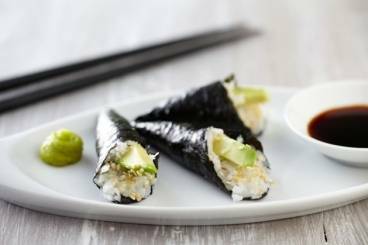 An American invention, this sushi roll combines the sunny flavours of avocado and crab. A square California maki roll with sesame, avocado and tuna. 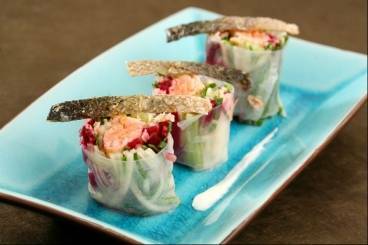 'Inside-out' California maki rolls with carrot, cucumber and tofu. An inside out maki roll filled with crab, avocado, sesame seeds and a touch of wasabi. A simple maki roll filled with sea bream, avocado and sesame seeds. Sometimes called a California roll, this sushi has the rice on the outside of the seaweed. Filled with ripe avocado and fresh crab it is a true fusion of Japanese and US food cultures. A classic sushi starter with wonderful flavours. 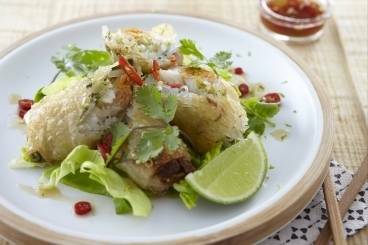 Serve at a dinner party to impress your guests!